This recipe was generous donated by a fellow viewer, Angelrae, enjoy her version of a quick and easy dinner! Love Lasagna? 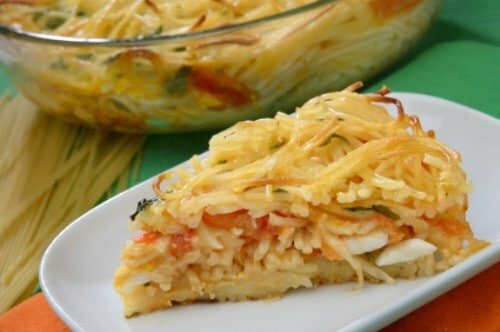 You are going to love how easy it is to make Spaghetti pie. Put cooked spaghetti (not rinsed) in large bowl with: butter, parmesan and eggs After you mix this well, put into a buttered 10 x 14 pan or put into two pie pans and freeze one if you want smaller portions. Pour spaghetti sauce on top, spread on cottage cheese. Sprinkle more Parmesan cheese. Bake at 350 for thirty minutes. Put on mozzarella cheese and make ten more minutes. I would really like to see the recipe for the spicy chicken rigatoni from buca di beppos hawaii. Thank you for your request. I will see what I can do.